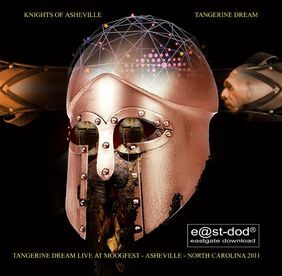 Knights Of Asheville features the complete concert Tangerine Dream performed during the Moogfest 2011. The concert had been already available for free as an internet stream via the National Public Radio and was released in early December 2011 as a proper physical release as well -- including the studio bonus track View From A Distant Star unavailable elsewhere. This composition was planned to be performed live as well but had to be left out due to the strict time schedule throughout the festival. With Asheville Sunrise, the live set contains another previously unreleased composition. The 16-page booklet features about 30 photos from the festival, as well as the track listing and credits. The Eastgate Music Shop about the CD release "It's end of October, the 28th, 2011, 8 pm -- a night to remember for many fans -- a lot of them already in funny Halloween costumes -- who turned up at Moogfest especially for the Tangerine Dream performance at the Thomas Wolfe Auditorium in Asheville, NC. American, Canadian as well as British TD fans have such a loyal connection to the energy of a TD concert that it is even for the band themselves always a breathtaking experience. 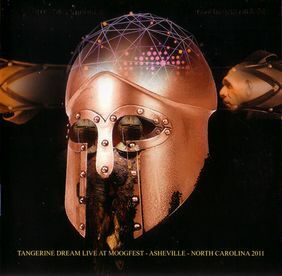 Now in their 44th year after the name Tangerine Dream appeared first time in public, one could assume that the musical energy has probably slowed down, but it is the opposite, a bundle of energetic rhythms, sounds and lead lines will accompany you through a night of a remarkable live experience. The concert has been exclusively recorded by the NPR (National Public Radio/USA). But now you will hear the real thing -- as human as it was but with a significantly improved mix!! TD also added a bonus track which they unfortunately couldn't perform as the festival was subject to enormous time pressure. Enjoy the Knights Of Asheville -- another chapter of a European musical legend." On the same day the CD was officially released this album became available as MP3 download at the Tangerine Dream Download Shop as well.